Chances are you’ve been told that social media is the best way to expand your marketing reach. But you may be at a loss as to which channel is the best medium for you, as a group travel planner. Where should you invest your effort? Which is best for a type of message? Here we break down three popular channels you can use to get your message out there and grow your network, based on audience and content style. Despite its recent tribulations over privacy, Facebook remains the best overall channel for outreach to your core travel community. About 68% of all American adults are on Facebook – and approximately 74% of those users report visiting the site every day. 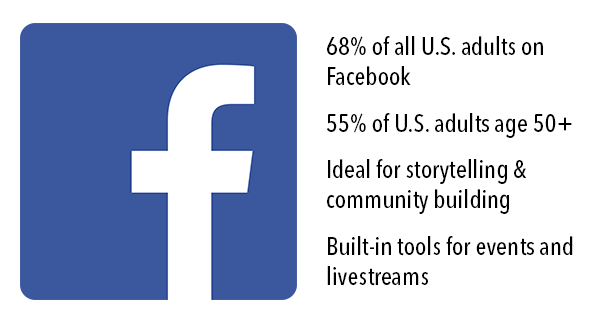 Facebook not only hosts the lion’s share of users, it also reaches a wide spectrum of demographics, including a swath of adults over 50 not found on other social media sites. Posting interesting news about an upcoming destination with links to your program is a good recruiting tool. Plus, through sharing, it can attract new members with a positive message about your organization. Facebook is a great way to foster a sense of community with your colleagues and potential participants. You might choose to run a Facebook page that constituents can like and follow, or you might opt for a Facebook group to encourage equal participation from every member. Because Facebook doesn’t have a character limit like Twitter, it’s a great avenue for storytelling – just don’t forget visuals! Users are more likely to stop zombie scrolling if an eye-catching photo breaks up the wall of text. You can upload a few photos on one post, or you can create an album with up to 1000 photos. Photo posts are perfect for grabbing someone’s attention, but albums might be a great way to keep a cache of photos as marketing content. If you’ve planned travel or been in the field before, use Facebook albums for potential participants to see your accomplishments – and get a taste of what they might experience when traveling on your program! While Twitter employs similar social media strategies as Facebook, there are some differences in format and market. 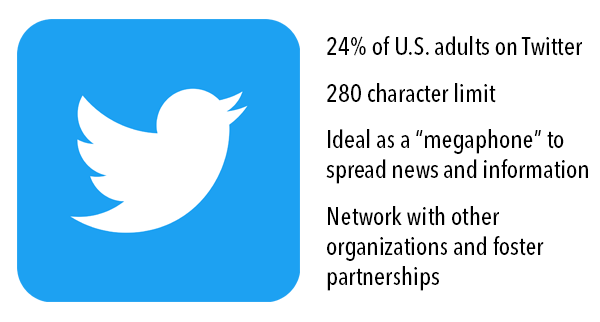 Only 24% of Americans use Twitter, and its users skew younger than Facebook’s. While this may seem discouraging compared to Facebook’s titanic numbers, Twitter has a few advantages in its setup. Because of its 280-character limit, Twitter allows for quick, succinct info to move fast. It lends itself well to sharing news and information and spreading awareness, serving as a kind of “megaphone” to amplify your message. Where Facebook has a stronger advantage for fostering connections within your community, Twitter has a slight edge for networking with kindred organizations that are more likely to have a multi-platform social media presence. Visuals are still key on Twitter; you can post up to four per tweet. If you have some photo editing skills, it’s worth your while to format the images to best accommodate the preview window. It’s also a good idea to ensure that any tweeted links will generate a Twitter “card” (the preview text and image below your tweet, usually pulled from a link’s metadata). Not sure if a link will generate a card? Use this tool to test your links for card generation. Instagram is the new kid on the block of social media and lends itself to travel. Where numbers on Facebook and Twitter have been relatively consistent in the last two years, Instagram has seen a 7% increase in users since 2016. 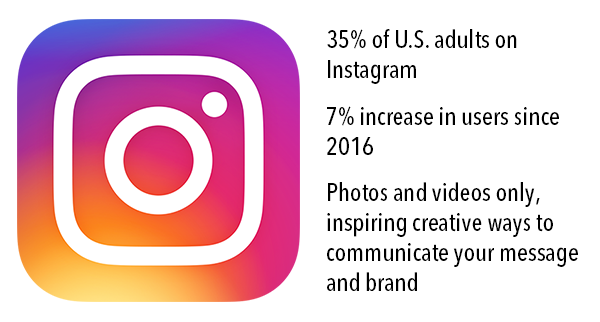 In 2018, approximately 35% of American adults use Instagram, and although these users are primarily age 18-24, there is still some surprising traction among older adults: about 40% of adults ages 30-49 use Instagram. Instagram’s strength lies in the fact that it is a purely visual medium. Though you can caption your photos with text and hashtags, the driving force of any Instagram feed is the image. You can post pictures as well as videos, and even create stories through a series of photos. Because your content must be channeled into a visual, it encourages creative ways to communicate your message and simultaneously boosts results with attention-grabbing imagery. Some of your posts will be more sales-oriented, and others will be news-related. Some will have a call to action; others will have an offer; some will ask for feedback, post photos, tell stories, network, link blog posts, or share from other accounts. This variety will serve you well – just be aware of what you’re posting and keep the categories balanced. Many people focus on generating content for their social media platforms and completely overlook the conversational aspect. People are more likely to interact with you if you demonstrate reciprocity. So even without frequent original posts, you can still see growth by asking and answering questions, getting feedback, posting replies, liking, and sharing. Show your personality and passions. Participants – especially those who might travel with you or your organization – want to know you, and connect with you. Whether you’re passionate about birds, reptiles, conservation, or travel itself, it’s important to show that excitement. You’ll attract people who feel the same way, and will want to support you.